Very quiet detached villa, 50 meters from the beach. Very close to the beautiful harbour of Pornic (15 minute walk). Sunny terrace, large safe garden and car parks. 5 bedrooms, 2 bathrooms. WIFI. Fully equipped kitchen, fireplace. During low season it is possible to rent only the ground level for 4 persons -2 bedrooms-. Ask for futher information. Tel: 0033 (0) 681 434 483. The area has activities ranging from, golf, sailing, surfing, fishing, riding and cycling. Situated near Nantes, Pornic is a great location for those wishing to explore south Brittany. The house was very spacious and provided for the needs of 3 generations! The large enclosed garden was ideal and safe for the children to play. We made the most of having the coastal path so accessible and went on many walks. We would recommend this house to family and friends, and would love to return ourselves! Accurate description of this large house for our extended family. Six adults, a three year old and two babies who had ample space. Wonderful to be able to park our cars and not use them again until our return journey a week later. Very warm welcome and everything explained. Sandy beach a two minute stroll away as was the creperie with such stunning views. Ten minutes walk into town by road to the heart of Pornic or fifteen to twenty minutes by the coast path route. Red squirrels in the garden a bonus. The house is in a lovely area of SOUTH Brittany. The coastal path, just one minute away, is brilliant for walking, bird watching etc. The house is well-suited for children, with ample facilities. The large garden is a real bonus. A friendly town and superb location. Made to feel welcome from start to finish. Will definitely go back. Une semaine de vacances très appréciée ! Nous avons passé une excellente semaine et avons vraiment apprécié le calme, les déjeuners quotidiens sur la terrasse abritée et les soirées au coin du feu. 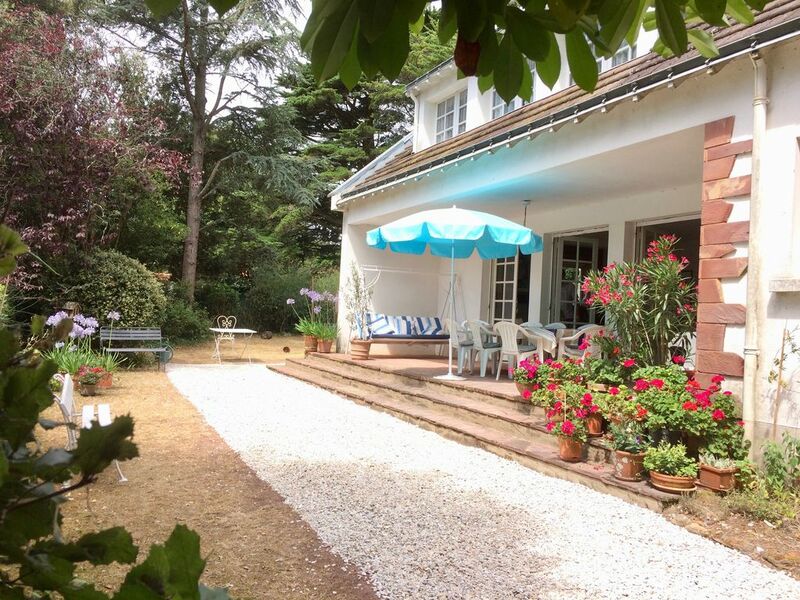 La villa est confortable, spacieuse et très bien équipée : l'idéal pour un séjour familial ! De plus, sa situation à 50m des chemins côtiers et à proximité de Pornic a permis à chacun d'écouter ses envies et de partir à la découverte. La côte est magnifique et, au bout de la rue, la crêperie surplombant la plage est un atout supplémentaire ! Merci aux propriétaires pour leur accueil, leurs conseils et leur disponibilité. Nous aurons plaisir à revenir ! Description conforme à la réalité avec une bonne surprise, plage encore plus près qu'indiquée dans l'annonce. Maison très agréable à vivre avec un beau jardin et une grande terrasse dont on profite en journée comme en soirée. On peut se passer de voiture. Propriétaires accueillants.